West Nile virus is 1 of more than 70 viruses of the family Flaviviridae of the Genus Flavivirus. Serologically, West Nile virus is a member of the Japanese encephalitis serocomplex, which includes Japanese encephalitis virus and an endemic North American flavivirus, St Louis encephalitis virus. West Nile viruses can be designated into at least 5 phylogenetic lineages. Only lineage 1 and 2 WestNile viruses have been associated with significant outbreaks in humans. Lineage 1 can be further subdivided into 3 sublineages: isolates from the western hemisphere, Africa, the Middle East, and Europe constitute lineage 1a; Kunjin virus from Australasia represents lineage 1b; and lineage 1c consists of viruses from India. The initial North American isolates (East Coast genotype) identified in 1999 in New York City have been most closely related to a lineage 1a West Nile virus isolated from Israel in 1998. WNV is maintained in nature in a cycle involving transmission between birds and mosquitoes. Some infected birds, can develop high level of virus in their bloodstream and mosquitoes can become infected by biting these infected birds, after about a week, infected mosquitoes can pass the virus to more birds when they bite. Humans, horses and other mammals can also be infected. Human infection is most often the result of bites from infected mosquitoes. Mosquitoes become infected when they feed on infected birds, which circulate the virus in their blood for a few days. The virus eventually gets into the mosquito's salivary glands. During later blood meals (when mosquitoes bite), the virus may be injected into humans and animals, where it can multiply and possibly cause illness. However, humans, horses and other mammals are “dead end”. That because they do not develop high levels of virus in their blood steam and cannot pass the virus to other biting mosquitoes (Figure 1). Figure 1. 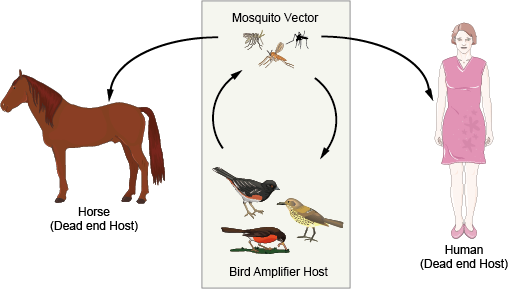 The transmission cycle of West Nile Virus. The incubation period for clinical illness generally ranges from 2 to 14 days, but prolonged incubation periods of up to 21 days have been observed among immunocompromised patients. Infection with WNV is either asymptomatic (no symptoms) in around 80% of infected people, or can lead to West Nile fever or severe West Nile disease. About 20% of people who become infected with WNV will develop West Nile fever. Symptoms include fever, headache, tiredness, and body aches, nausea, vomiting, occasionally with a skin rash (on the trunk of the body) and swollen lymph glands. The symptoms of severe disease (also called neuroinvasive disease, such as West Nile encephalitis or meningitis or West Nile poliomyelitis) include headache, high fever, neck stiffness, stupor, disorientation, coma, tremors, convulsions, muscle weakness, and paralysis. It is estimated that approximately 1 in 150 persons infected with the West Nile virus will develop a more severe form of disease. Serious illness can occur in people of any age, however people over the age of 50 and some immunocompromised persons (for example, transplant patients) are at the highest risk for getting severely ill when infected with WNV. Meningitis characterized by clinical signs of meningeal inflammation, including nuchal rigidity, Kernig or Brudzinski sign, or photophobia or phonophobia Encephalitis characterized by depressed or altered level of consciousness, lethargy or personality change lasting more than 24 hours. WNV is a flavivirus transmitted primarily mainly by Culex mosquitoes to vertebrate hosts. Flaviviruses include members such as dengue virus, yellow fever virus, Japanese encephalitis virus and tick-borne encephalitis virus and are positive strand RNA viruses that contain three structural proteins and a host-derived lipid bilayer. The E glycoprotein is the major flavivirus structural protein present on the viral surface, as well as the dominant target of neutralizing antibodies. The E glycoprotein is responsible for binding the host cellular receptor as well as endosomal fusion (Figure 2A). The mature WNV virion is ~50 nm in diameter with 180 copies of the E glycoprotein smoothly arranged in a head-to-tail homodimeric fashion. The homodimeric arrangement of the E protein shields exposure of the DII fusion loop at neutral pH. The symmetry of the E proteins creates three unique chemical environments according to the orientation into 2-, 3-, or 5-fold symmetry axes (Figure 2B). Immature WNV virions have a distinct structural composition relative to the mature virion. Unlike the mature virion, the immature virus maintains 180 copies of uncleaved prM protein, non-covalently associated with each E protein. These prM/E heterodimers form 60 trimeric spikes (a trimer of heterodimers) arranged with icosahedral symmetry (Figure 2C), with the DII fusion loop radiating outward from the virus center. Figure 2. West Nile virus (WNV) structure. (A) Ribbon diagram of the crystal structure of WNV E ectodomain residues 1–400 colored by domain: DI (red), DII (yellow), and DIII (blue). The fusion loop (residues 98–110) is shown in green; (B) Pseudoatomic cryo EM reconstruction model of the mature WNV virion; (C) Pseudoatomic cryo EM reconstruction model of the immature WNV virion. • Virus isolation by cell culture. IgM can be detected in nearly all cerebrospinal fluid (CSF) and serum specimens received from WNV infected patients at the time of their clinical presentation. Serum IgM antibody may persist for more than a year. Detection of IgM antibody in serum or cerebrospinal fluid (CSF) using the IgM antibody-capture enzyme-linked immunosorbent assay (MAC-ELISA) forms the cornerstone of West Nile virus diagnosis in most clinical settings. Because IgM antibody does not cross the blood-brain barrier, its presence in CSF indicates CNS infection. Treatment is supportive for patients with neuro-invasive West Nile virus, often involving hospitalization, intravenous fluids, respiratory support, and prevention of secondary infections. Several investigated therapeutic approaches include immune γ-globulin, West Nile virus–specific neutralizing monoclonal antibodies, corticosteroids, ribavirin, interferon α-2b, and antisense oligomers. No study has documented efficacy, in part due to difficulty in recruiting sufficient numbers of patients. Case reports or uncontrolled clinical series suggesting efficacy should be interpreted with extreme caution due to West Nile virus’s highly variable clinical course. No vaccine is available for humans. Despite4licensed equine vaccines and promising preliminary results from several phase 1 and 2 human vaccine candidates, phase 3 efficacy trials have not been attempted due the unknown market potential of a West Nile virus vaccine and logistical difficulties in conducting phase 3 clinical trials for this sporadic and widely dispersed disease. West Nile virus prevention relies in part on methods to reduce the numbers of West Nile virus–infected mosquitoes. Community based mosquito control programs using integrated pest management principles proactively identify the sources of vector mosquitoes and use several methods such as elimination of breeding sites, larviciding, and targeted adult mosquito control to prevent adult mosquito populations from achieving levels that increase human infection risk. 1. Mukhopadhyay S, Kim B S, Chipman P R, et al. Structure of west nile virus[J]. Science, 2003, 302(5643): 248-248. 2. Petersen L R, Brault A C, Nasci R S. West Nile virus: review of the literature[J]. Jama, 2013, 310(3): 308-315. 3. Kanai R, Kar K, Anthony K, et al. 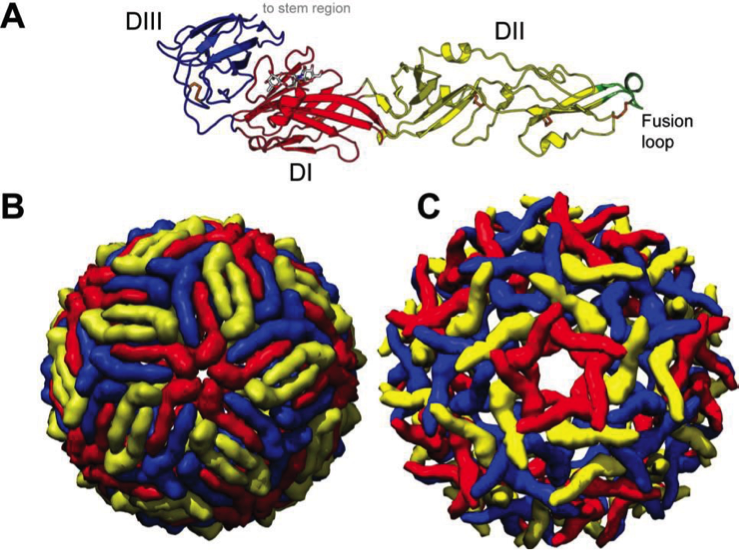 Crystal structure of West Nile virus envelope glycoprotein reveals viral surface epitopes[J]. Journal of virology, 2006, 80(22): 11000-11008. 4. Kramer L D, Styer L M, Ebel G D. A global perspective on the epidemiology of West Nile virus[J]. Annu. Rev. Entomol., 2008, 53: 61-81. 5. Nybakken G E, Oliphant T, Johnson S, et al. Structural basis of West Nile virus neutralization by a therapeutic antibody[J]. Nature, 2005, 437(7059): 764-769. 6. Roehrig J T. West Nile virus in the United States—a historical perspective[J]. Viruses, 2013, 5(12): 3088-3108.